BLACKPINK IN YOUR AREA! Or at least they will be because BlackPink is finally making a long-awaited comeback this week after a much long hiatus. Ever since I posted my first fan stick I've been asked many times to make to BlackPink's lightstick so I'm very excited to share this pattern with you all! BlackPink's fans are called Blinks and though they haven't confirmed it I'm pretty sure their fan colors are black and pink but that could just be a lucky guess. When I searched online I couldn't find a name for the lightstick so if anybody knows let me know. 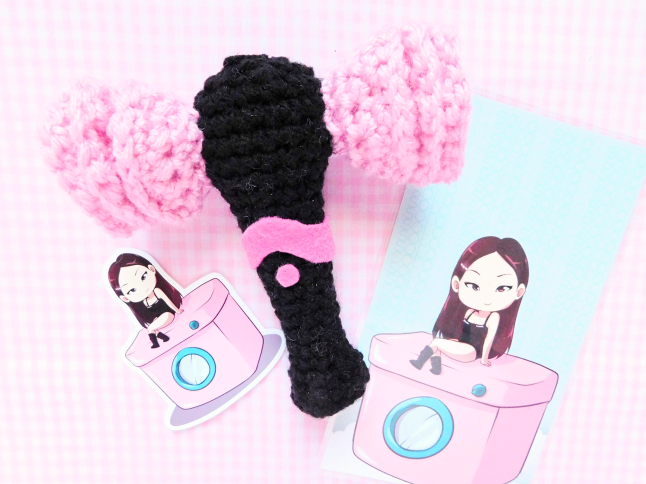 The lightstick was designed by the members, it has a black handle and pink hearts on each end to resemble the shape of a hammer. 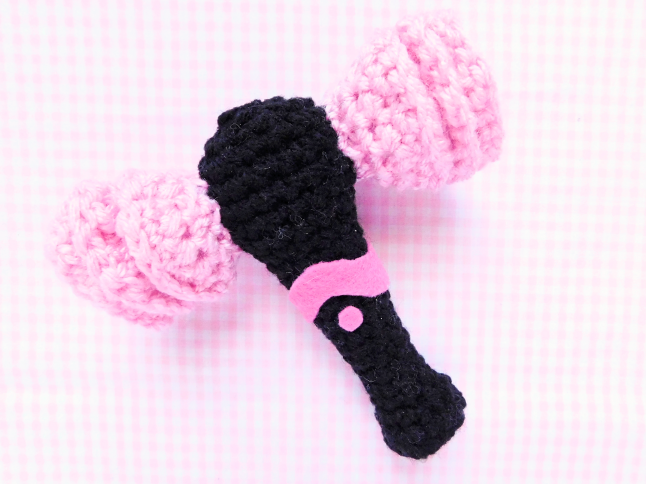 I like how they got creative with their lightstick because I love crocheting unconventional light/fan sticks. 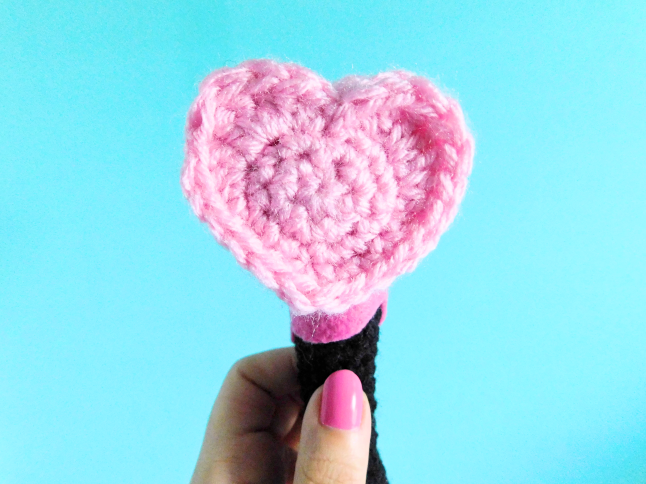 The pink part with the hearts was difficult to crochet because I couldn't get the heart shapes quite right and I didn't want to use anybody else's heart crochet pattern so I tried and gave up many times but finally, one night while I was crocheting I created a heart that I was satisfied with. I almost published another version with a different heart part but I'm happy that I didn't because I prefer this one. keep dec until you read 2-4 sts, finish stuffing, and sew shut. Round 4: slst, 2dc, 3tr, 2dc, hdc, sc 3 sts, 2dc, hdc, 2dc, 3tr, 2dc, slst to the center of the heart. Round 5: sc on the back part of the heart (behind the sts). Total = 24 sts. 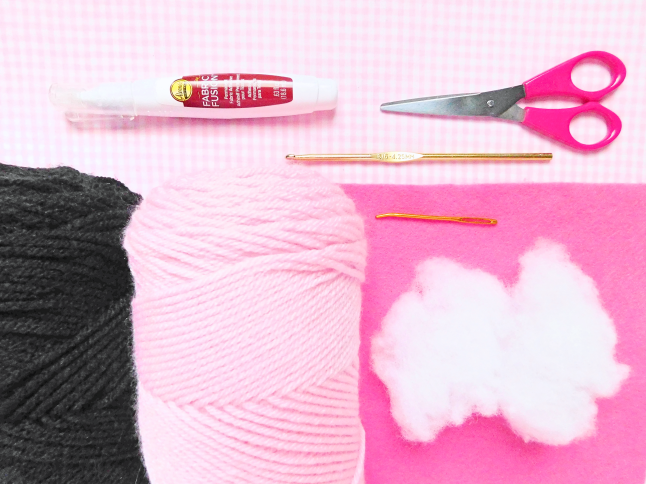 Layer the hearts on each other and sew together minus the heart that you stuff. Next, sew the heart pieces on each end of the black handle, use sewing pins to keep everything aligned. Weave in loose ends. 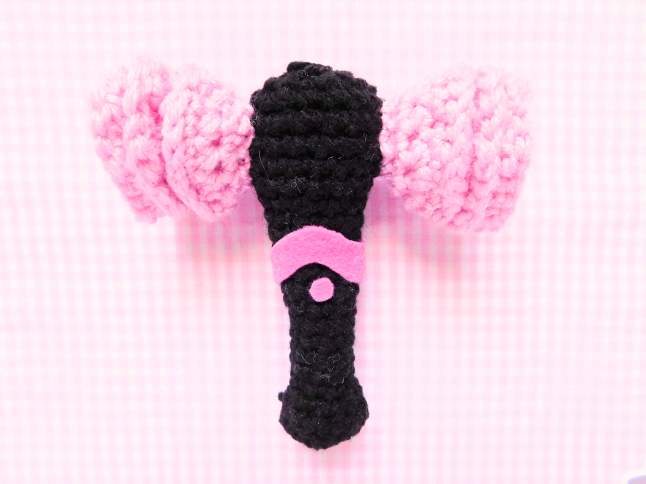 With pink felt, cut out the details on the handle. You can make a pattern on a piece of paper to help guide you if you like, I did this for the pink rim part. I normally don't make buttons for fan sticks but the stick looked empty so I added the button. Glue everything down with some glue and press lightly to secure. I didn't add the BLACKPINK logo on the handle (or hearts) because you couldn't really tell when the black felt was on the black yarn. I mean can you even tell that I put the logo on the MONSTA X fan stick? But you can choose to add the logos if you want. Are you a fan of BlackPink?